Born and raised on Long Island, NY (and still a passionate Yankee fan). 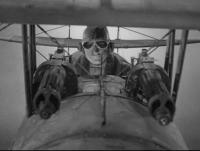 As a boy, I built all the Aurora Famous Fighter WWI aircraft. Entered the Air Force in 1968 and served a year at DaNang Air Base in Vietnam. Moved to Arizona after discharge and then, later, to Southern California, where I have been the pastor of Temple Baptist Church since 1981. Got back into modeling in 2005, when I again built the old Aurora kit of Richthofen's Fokker Dr.1. My first exposure to IPMS was at the National meeting in Anaheim in 2007. From that experience I hooked up with our local club - IPMS/Orange County and have been an active member since 2009. It was at that time that my modeling took on a more serious profile and I have been attempting to increase my skills constantly. I have been fortunate enough to have numerous awards at contests, locally, regionally and nationally (Arizona and Omaha).